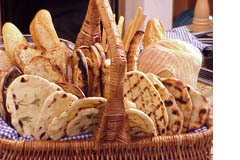 DESCRIPTION: Imagine the enveloping smell of freshly baked bread wafting from your own kitchen. This hands-on class covers the fundamentals of successful bread baking, including ingredient fundamentals, mixing and shaping dough, and different baking techniques. Bake amazing artisan loaves you can replicate in your own home.